Brandtwords: WANT TO RETROLOVE? GET THE BOOK! WANT TO RETROLOVE? GET THE BOOK! Wow! Two sold-out houses and standing ovations for RetroLove: The Show here in Philadelphia thanks to Philadelphia Jazz Project and my stellar collaborators Monnette Sudler and Joilet Harris. I have to say that I was more than a tad nervous to make the leap from page to stage but it was so gratifying to feel the audience join us on this RetroLove journey. Stay tuned for an upcoming video and record (!) thanks to PhillyCAM and Turtle Studios. In the meantime, if you loved the show or missed the show, you can make your own RetroLove happen by getting the book. (There is a bonus poem or two that were not in the show.) 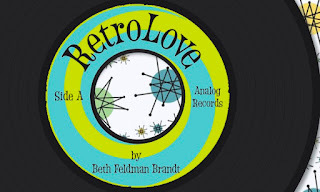 RetroLove is about being in that retro moment but also looking back, with kindness, for our younger selves. If you RetroLove it, you can buy the book here. Thanks to Greenleaf Poetry Press and Deidra Greenleaf Allen, publisher and designer extraordinaire. and the quiet when even the dog is asleep. even when it’s hard, it is still sweet. I miss dark coffee at midnight. but not half bad when I smile. I don’t rush out the door like I used to. I have more time -- and less.